Several years ago we added twenty iPad 2s to use in our children’s and teen programming. They have a variety of apps on them ranging from early literacy and math apps to Garage Band and iMovie to Minecraft and Clash of Clans*. Ten of the iPads are geared towards younger kids and ten are slanted towards teen interests. Not surprisingly, the iPads were very popular when we first acquired them. We treated app selection as an extension of our collection development policy. Both the Children’s and Adult Services departments have a staff iPad they can use to try out apps before adding them to the programming iPads. We bought a cart from Spectrum Industries (a WI-based company; we also have several laptop carts from them) so that we had a place to house and charge the devices. The cart has space for forty iPads/tablets total. 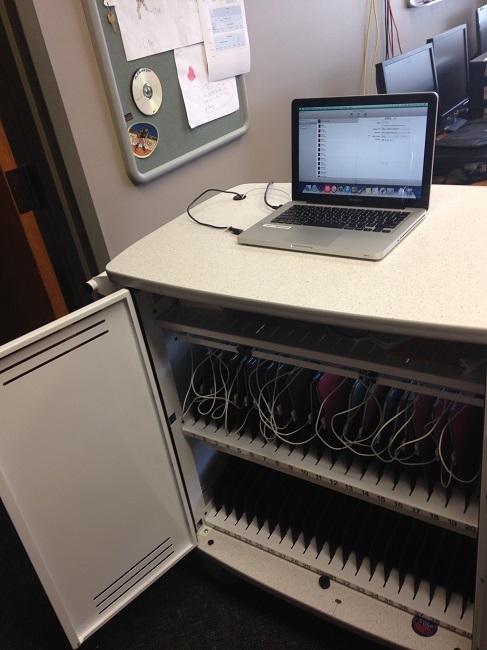 We use an Apple MacBook and the Configurator app to handle updating the iPads and adding content to them. We created a Volume Purchase Program account in order to buy multiple copies of apps and then get reimbursed for taxes after the fact. The VPP does not allow for tax exempt status but the process of receiving refunds is pretty seamless. 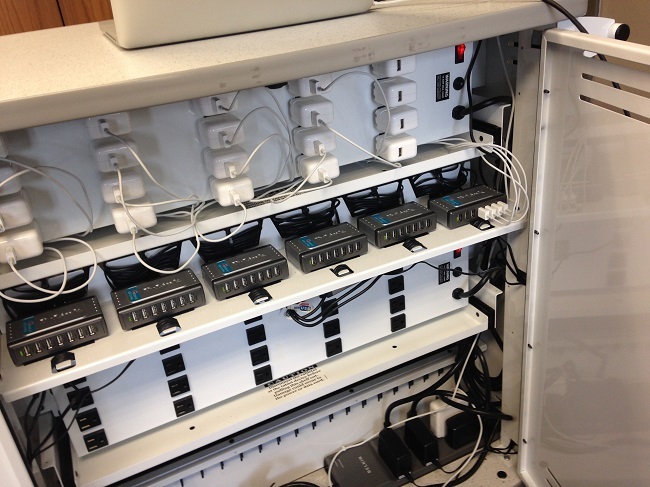 The only ‘bothersome’ part of updating the iPads is switching the cable from the power plug to the USB ports (see above) and then making sure that all the iPads have their power cables plugged firmly into them to make a solid connection. Once I’d done it a few times it became less awkward. The MacBook needs to be plugged into the wall or it won’t have enough power for the iPads. It also works best running on an ethernet connection versus WiFi for downloading content. It takes a little effort to set up the Conifgurator** but once you have it done, all you need to do is plug the USB into the MacBook, launch the Configurator, and the iPads get updated in about ten to fifteen minutes even if there’s an iOS update. Everything was great. Patrons loved the iPads. They were easy to maintain. They were getting used. Then the school district got a grant and gave every student, K-12, their own iPad. They rolled them out starting with the high school students and eventually down through the Kindergartners. The iPads are the students’ responsibility. They use them for homework and note-taking. Starting in third grade they get to take them home over the summer. Suddenly our iPads weren’t so interesting any more. Not only that, but our computer usage plummeted. Now that our students had their own Internet-capable device they didn’t need our computers any more. They do need our WiFi and not surprisingly those numbers went up. There are restrictions for the students. For example, younger students can’t put games on their iPads. And while older students have fewer restrictions, they don’t tend to put pay apps on their iPads. That means we have things on our iPads that the students couldn’t or didn’t have. I started meeting with the person at the school district in charge of the program a couple times a year. We talk about technology we’re implementing at our respective workplaces and figure out what we can do to supplement and help each other. I’ll unpack this in a future post and talk about creating local technology partnerships. Recently I formed a technology committee consisting of staff from every department in the library. One of the things we’ll be addressing is the iPads. We want to make sure that they’re being used. Also, it won’t be too long and they will be out-of-date and we’ll have to decide if we’re replacing them and whether we’d just recycle the old devices or repurpose them (as OPACs potentially?). We don’t circulate iPads but I’d certainly be open to that idea. How many of you have iPads/tablets in your library? What hurdles have you faced? ** It’s complicated but worth spelling out so I’m working on a follow-up post to explain the process of creating a VPP account and getting the Configurator set up the way you want it. Original Content apps, ipad, programming. permalink.